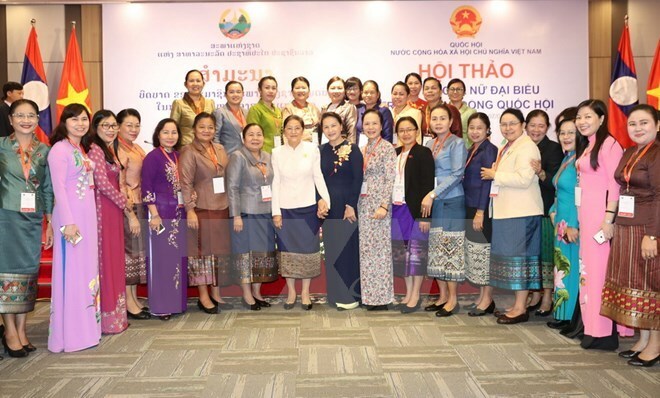 Da Nang (VNA) – Vietnamese and Lao female legislators met at a seminar in the central city of Da Nang on August 7 to discuss women deputies’ role in National Assembly activities. Speaking at the opening ceremony, National Assembly Chairwoman Nguyen Thi Kim Ngan said the 14th NA records 132 elected women, bringing the total rate of female deputies to 26.7 percent, up 2.3 percent from the previous tenure. She said with the establishment of the Group of Vietnamese female lawmakers, members have a chance to exchange and learn from each other’s experience, thereby improving the legislature’s operational efficiency and raising their common voice on policies regarding women, children and gender equality. Ngan said the seminar affords participants a chance to share experience in promoting parliamentary activities and gender equality in particular. Chairwoman of the National Assembly of Laos Pany Yathotou hailed the significance of the event, saying that it will help institutionalise issues involving gender equality and protection of women’s and children’s rights. She called for increased collaboration between female parliamentarians in ASEAN, and those between Laos and Vietnam for mutual development. Among 149 Lao NA deputies for the eighth tenure, 41 are women, accounting for 27.5 percent.